Tribune Media, which owns and operates 42 TV stations, said Monday it’s exploring “strategic and financial” options, including possibly selling businesses and assets, as losses mount and advertising sales tumble. Based in Chicago, Tribune Media, whose assets include cable network WGN America, also reported that its fourth quarter net loss totaled $381 million, swinging from $314.7 million of profit a year ago. Earnings per share, after adjusting for some items, totaled 63 cents, compared with 54 cents estimated by analysts who were polled by S&P Global Market Intelligence. “The strategic and financial alternatives under consideration include, but are not limited to, the sale or separation of select lines of business or assets, strategic partnerships, programming alliances and return of capital initiatives,” Tribune Media said. Shares of Tribune Media rose 7.4% to $35.38 in morning trading. Tribune Media’s plans to overhaul its business come less than two years after it spun off its publishing business — now called Tribune Publishing — in August, 2014 as a separate, publicly traded entity in order to focus on its broadcasting and digital properties and shield them from declining print revenue. Like other broadcasters, Tribune Media has had to contend with online streaming, changing consumer behavior and the volatile cyclicality of TV advertising. And much of its revenue drop in the fourth quarter — down 1% to $547.6 million — can be attributed to lower advertising sales. Excluding political advertising, operating revenue would have increased 8%, it said. Its TV and entertainment advertising revenue fell 9.3% to $346.5 million. Tribune Media previously announced it’s selling Tribune Tower, its iconic headquarters building in Chicago, and the north block of the Los Angeles Times Square building in Los Angeles. It’s now looking to unload more real estate properties, it said. “We believe that the value of the portfolio of businesses of Tribune Media is not fully reflected in the stock price,” said board chairman Bruce Karsh in a company statement. Tribune Media said its board approved a plan to spend up to $400 million to buy back its Class A common stock. 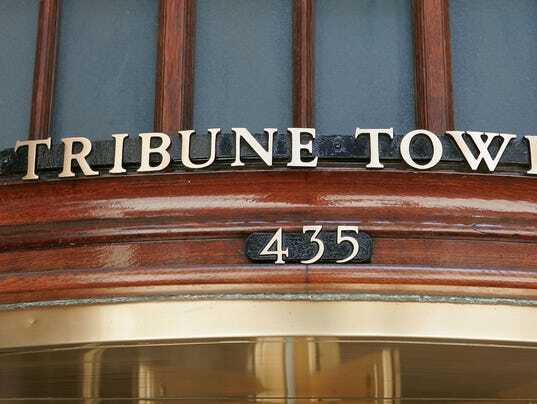 Meanwhile, Tribune also entered into a new two-year employment contract with CEO Peter Liguori. It also named interim CFO Chandler Bigelow as CFO. For the full year 2015, Tribune Media’s revenue rose 3% to $2.01 billion. Net loss for the year totaled $319.9 million vs. $476.7 million of profit in 2014.